Why did I read this book: When I first heard about this book, I honestly thought it was all an elaborate prank. I am a HUGE fan of both authors (their books have made my top 10 on occasion) and the premise sounded too good to be true. Then I was on Twitter talking about this awesome prank I had heard about when both authors confirmed this was a true book. Needless to say, I had to read. Team Human surprised the hell out of me. I was expecting it to be a good satire but it manages to be much more. Mel is not a huge vampire fan. I mean, it’s not like she goes out of her way in her dislike but neither does she think a lot about them. In her town – New Whitby – vampires stay in their part of town, she stays in hers. But then worlds collide when a vampire enrols at her high school and her best friend Cathy (who would have been a vampirologist if that was an actual career) starts to fall in love. Mel is duly horrified at the prospect of losing her best friend to the undead and starts a campaign to save Cathy from Francis’ attentions. Whatever it takes. In the meantime, her other friend Anna is having problems of her own: her father left her family for a vampire and her mother is behaving oddly. Since Mel has taken upon herself to always help her friends in time of need, she starts an investigation of her own. An investigation that will lead her to cross paths with a vampire cop, her human son not to mention, zombies. But to say that Team Human is simply a tirade against vampires would be doing the book a disservice. Yes, it satirises a lot of Team Vampire’s most common shortcomings but without losing sight of the fact that Vampires can be extremely allure. Mel might sit firmly on Team Human (and this never changes) but part of her arc is to realise not only some of her prejudices but also to learn to sympathise and understand other people’s choices. Not to mention the fact that the setting of the novel (and there is one) is one where Vampires exist in the world and humans have known about them since forever. There is also the development of rules to a very specific worldbuilding for this world (I loved how the authors combined Zombie and Vampire lore in a way that made perfect sense). Vampires here supposedly lose all of their human emotions when they become vampires and are incapable for example, of laughing. And since Mel is one of those people who love to laugh, becoming a vampire is unthinkable to her. 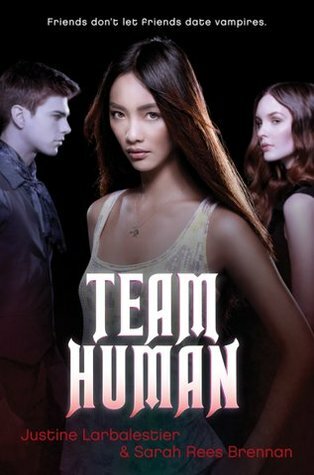 In that sense, the authors managed the improbable: Team Human is a book for both vampire haters and lovers. As a firm member of Team Human, I loved it. But that’s because the book is not only a satire – and that’s where it really surprised me. Knowing the authors’ sense of humour, I was expecting it to be laugh-out-loud funny. And it was, but it was also extremely charming and poignant. Because you see, at its core this is a book that lovingly portrays all kinds of relationships between people (human or not). Its main focus is Mel and her love for her girlfriends, a love that is so fierce and deep that she would do anything to help them. I absolutely, completely loved Mel and her friends. More than that, Team Human features great sleuthing shenanigans, awesome kisses, girls who are capable of making their own informed decisions, girls who make earnest mistakes and learn from them and a world that is diverse in terms of race and sexual identity. I just realised I managed to write the driest EVER review for a book that is not only extremely funny but also full of remarkable warmth. In the end, I laughed. A lot. What I didn’t expect was that I would also cry – a lot (good tears). I obviously FAIL at reviewing Team Human.I shall then resort to borrow the correct words from Maureen Johnson, who says it best: Team Human is in fact, TEAM AWESOME. “I can’t speak Mandarin or Cantonese or Hakka or any other Chinese language. Neither can my parents who are also ABC,” I said and made a face at Francis. Francis did not respond to my face making as well as he did to Cathy’s damsel-in-distress glances. Rating: 7 – Very Good leaning toward 8. I was on the fence about this one; I’m certainly Team Human, but I dunno, sometimes the weepy-sparkle genre seems like too easy a target. I’m glad to hear that it’s got heart as well as venom, and will definitely be picking this one up! I think you’ll be pleased to learn this isn’t a stand-alone; it’s going to get a sequel! I think both the authors mentioned it in the blog posts talking about Team Human. I was really surprised by Team Human too, but for whatever reason, I had trouble investing myself in the book, so I’m not sure I’ll stick around for said sequel. Heck, it doesn’t come out until 2013, so I’ve got plenty of time to think about it. I can’t wait to read this. And have been impatient for its relese ever since I first heard about it last year from Jodie. I didn’t know the release date was approaching this fast! I’m glad you say it’s more than a satire, that makes me even more eager to read it. oo, Asian person on the cover! Yes I get excited over that. This sounds like a fun, fun premise. I like it. I’m curious about this book, because I’m always up for a good satire with heart. I might pick up my own copy soon. I’m pretty excited about this book! I love Sarah Rees Brennan. I am a little nervous because I have had trouble really immersing myself in Justine Larbastier’s writing, but I’m going to pick it up anyway. I was going to buy this in any case, so it’s great to hear you enjoyed it. OH MY GOD, Estara! I hadn’t seen that before and it is one of my fave scenes from the book. KIT, I LOVED KIT. As an ABC myself, I love knowing the protagonist is ABC. And as a siciologist and someone who loves to laugh, this book sounds like one to buy soon. I was on the fence the to read or not to read fence after this review will be checking out Team Human. What does WOE stand for? i hadn’t been quite sure what to make of this (i’ll admit, i’d thought it was a joke at first, too) – but the more i hear about it, the more i want to read it. glad to hear you’re recommending it, ana! I’ll admit I was biting my nails a bit to see how you’d rate this one, but the WOE behind the ‘stand alone’ could have said it all! This book surprised the hell out of me, too. It was moving as well as witty. I completely agree. i love love loved this book as well – i agree that its poignancy took me by surprise. also, i love that Maine is the vampire capital of the world.